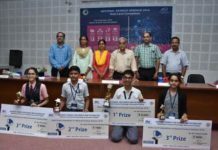 Ahmedabad: India is not only planning to send the satellites to the Moon and Mars, but also exploring new habitats in outer space for cultivating new hopes and hubs – expressed Dr. Virender Kumar, Director, Development and Educational Communication Unit (DECU) of ISRO at the State Level competition of the National Science Seminar held at Science City on Saturday. He also informed there is a need of exploring new habitats to advance our understanding in science and technology, while distributing prizes and certificates to the meritorious students at the State Science Seminar for School students on the topic “Pulses for Sustainable Food Security: Prospects and Challenges”. In order to inculcate a spirit of scientific inquiry and analytical thinking among the secondary school students, the Gujarat Council on Science & Technology (GUJCOST) organized the State Level Competition of the National Science Seminar at Gujarat Science City on 17th September 2016. As the United Nations designated 2016 as the International Year of Pulses, a key aim of which is to raise awareness of the contribution of pulses to the various societal challenges, the theme of the Science Seminar was “Pulses for Sustainable Food Security: Prospects and Challenges”. A total of 66 students from 33 districts were selected for the State Science Seminar. School students, in their presentations, lauded on the importance and the nutritional benefits of pulses as part of sustainable food production aimed towards food security and nutrition. The programme provides a unique opportunity to encourage connections throughout the food chain that would better utilize pulse-based proteins, further global production of pulses, better utilize crop rotations and address the challenges in the trade of pulses. Speaking on the occasion, Dr. Narottam Sahoo, Advisor, GUJCOST expressed that society today faces many challenges including diabetes, climate change, obesity, water scarcity, cardiovascular disease, biodiversity, nutrient deficiency, nitrogen depletion, stunting, food waste, cancer. In each case, pulses are part of the solution: a single truth that we perceive in different ways. They are the golden thread woven through the fabric of the more balanced and sustainable world we all wish to see. 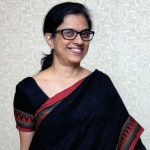 Ms. Chetsi Bhalani, Std. X student of St. Francis School, Jamnagar was adjourned as State winner and to represent Gujarat at the National Science Seminar at Mumbai next month. She was awarded with Rs.10,000/- as cash prize, certificate and memento from the Chief Guest during the valedictory session. Mr Maruf Pandya, Std X student of Modi School, Rajkot stood second prize with Rs.7500/- as cash prize and Ms. Ruchita Kayande, Std IX student of Sri Sri Ravishankar Vidya Mandir, Anand and Shri Amogh Sharma, Std. VIII student of Sir J J High School, Navsari jointly won Rs.5000/- each as the third prize. Dr. Mani Subramaniam, Sr. Scientist at Institute of Plasma Research (IPR), Dr. C. J. Clement, Professor at St. Xavier College, Dr. B. D. Patel, Agronomist, Anand Agriculture University and Dr. Vandana Shirohi, Scientist C, GUJCOST evaluated the students presentations as scientific jury members. All the 66 students were received merit certificates and an annual subscription of Safari science magazine at the State Science Seminar.